Mālama Hulē‘ia was spawned by two Kaua‘i community organizations that work in different ways with and on the water. The first is the Nawiliwili Bay Watershed Council, and the second is the Kaiola Canoe Club. In 2009 NBWC set for itself four priorities: 1. Restoration of Alekoko Fishpond. 2. Working with water rights advocacy groups to correct stream diversions. 3. Controlling nonpoint sources of water polution. 4. Restoration of kalo loi on kuleana lands. While some of the spark the for the NBWC may have gone out with the passing of founding member Cheryl Lovell-Obatake, the core concerns of the group are still alive and well. Key contributing members of NBWC, including Don Heacock, Carl Berg, Adam Asquith, and Debbie Jackson are actively planning for resurgence of the group. Moreover, in different ways these same people have shaped Mālama Hulē‘ia. Mālama Hulē‘ia’s vision for a revitalized watershed, including restoration of the Alekoko Fishpond, is the same as that envisioned by NBWC. And Mālama Hulē‘ia’s goal of eradicating red mangrove and restoring riparian areas and wetlands damaged by the mangrove contributes directly to NBWC’s goal of protecting and improving the health of the Nawiliwili Bay Watershed. The Kaiola Canoe Club has been and will continue to be the mother organization of Mālama Hulē‘ia. Although we are different corporations now, our formative years were as a project steering committee within the Kaiola Canoe Club. As active outrigger canoe paddlers, we felt the urgency to do something about the red mangrove invasion of the Hulē‘ia River and responded by forming Mālama Hulē‘ia. The following pages summarize our goals and initial efforts and reflect the affinity we feel for the Hulē‘ia River and surrounding area. For the years 2013 through 2014, Kaiola Canoe Club received two one year grants from NOAA and the Hawai‘i Community Foundation to start the mangrove eradication at a demonstration site next to the Kaua‘i County Niumalu Beach Park. In addition to funding mangrove eradication and native plant restoration, the grants provide for building community support and partnerships for long term stewardship of the area. Mālama Hulē‘ia is following suggestions from the community to make the demonstration site into a place for environmental and cultural education for local youth. 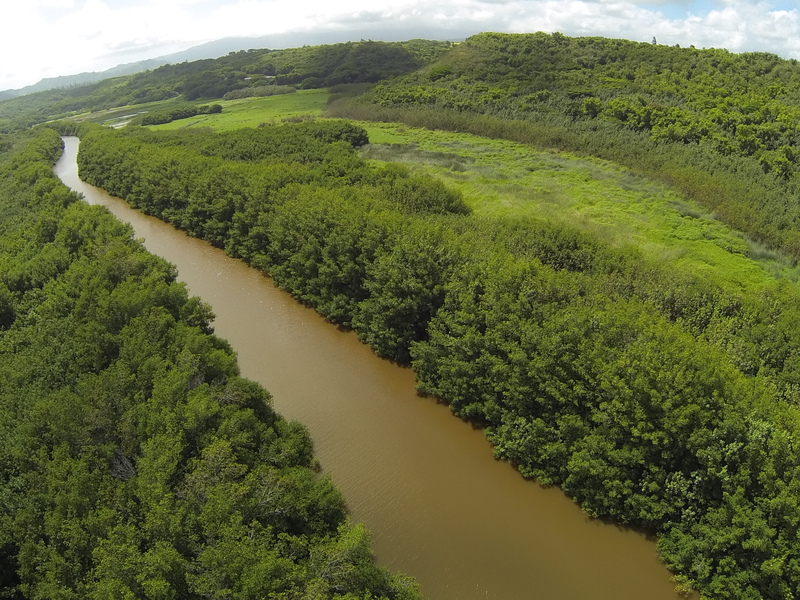 Beyond the two years grant-funded project, the mission of Mālama Hulē‘ia is to clear red mangrove from the entire Hulē‘ia River valley and estuary, and restore all cleared areas to native vegetation. 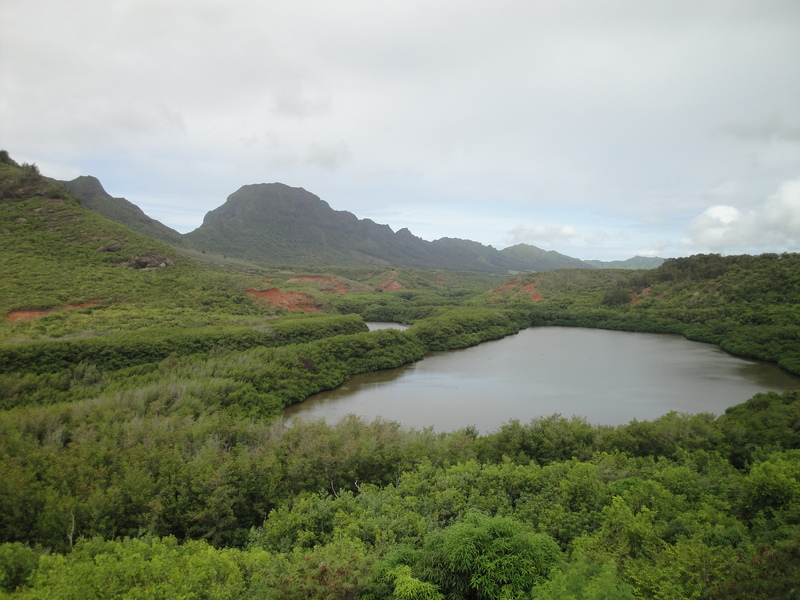 Ultimately, the areas to be restored should include the culturally precious ‘Alekoko (or Menehune) fishpond. 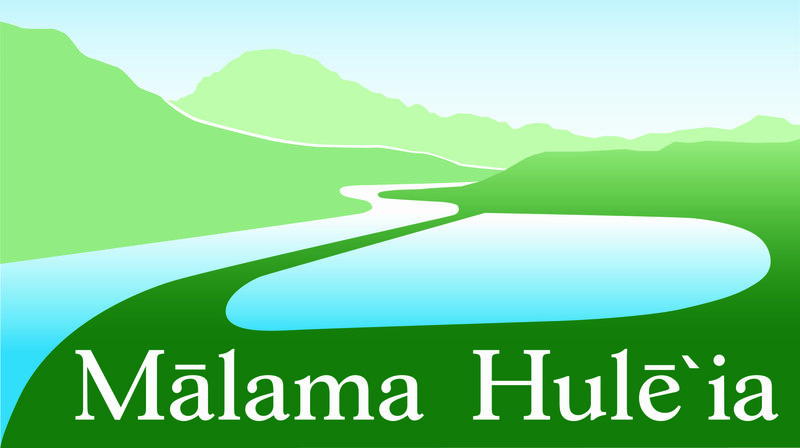 Our vision is that the entire ‘Ainakumuwai (Watershed) Hulē‘ia will one day be revitalized and as productive as it once was. The Alekoko Fishpond, 2012, with the Hulē‘ia River barely visible on its left.